Note: What follows is a legacy article about the Original Pocket WiFi (D25HW), and it's follow-on model (GP01). If you are looking for information on the Pocket WiFi G4 (GP02) or the Pocket WiFi LTE (GL01P), please see their respective pages. Update 4: Information about the Pocket WiFi Monitor software! Update 7: Info about GP01 Software Update 3 & D25HW Software Update. 3G network PC access is a great productivity booster for business (just ask any consultant), and is also great for using your PC on the go. Japan is also one of the more advanced countries when it comes to 3G networking coverage and speed. eMobile is one of the better providers, and the speed has become good enough recently to replace your home connection if you don't do any super heavy internet use. Unlike WiFi spots, it can be used almost anywhere, and the speed is more than good enough for most uses. Until now, the way this has worked is that you have a data card which connects to your PC via a card slot, or via USB. The computer sees this as some sort of modem, and can then use normal dial-up internet procedures to get you online from anywhere. Sometimes special client software is involved which can give you more information, such as data used, signal strength, etc. With eMobile's new two year contracts, you even have the pros of both pay-as-you-go internet (low fees if you don't use it much), and the pros of flat-rate unlimited internet (there is a maximum cap). There are some disadvantages as well, though. One disadvantage is that signal strength is not always the best, and your speed may suffer. Another disadvantage is that unless you set up connection sharing on the PC used to connect to the internet, your other computers and devices won't have internet, so you can only have one device connected at once. This also means if you want to connect your PSP, iPhone, etc., to the internet, you need to turn on your PC, connect it, and make sure the connection is shared. This will also only work if the devices in question support AdHoc WiFi mode (or Bluetooth). Another issue is that if you do want to connect multiple devices at the same time, you can get separate network cards for each, but your bill will also multiply. Some devices come with built-in 3G networking capabilities, but they are typically locked to one provider (f.e. the Sony Viao series only support NTT Docomo, the iPhone only works with Softbank, etc.). Pocket WiFi is a new device marketed by eMobile in Japan that connects to the 3G network automatically and works as a WiFi access point and router. You simply turn it on, and it will connect in seconds and start providing it's own network. You can turn on your PC and connect. In fact, this is much faster than connecting on your PC, because this device can wake up while your PC is waking up in parallel. There is no delay to recognize the USB device, dial-up, etc. Even using it with just one PC, there are a number of advantages. Start-up speed, as mentioned above, since this device starts connecting as soon as you turn it on, instead of having to wait for your PC to be fully awake and recognize it, the total time to be connected is realistically much less. Signal strength - One of the issues with the typical USB dongles is that they have to be used where your PC is used. If the 3G network strength isn't great at your bed or desk, then you might have to stand near the window, or use a long USB cable to get decent speed. With this device, you can simply place it on the window sill and get to work. Multiple devices - You can easily hook several PCs to this device at once with no mucking about with connection sharing options. Driverless - You don't need any special drivers or connection software, since all OSs support WiFi access points out of the box. Configuration is not even necessary, but possible and easy from the built-in web-server (similar to other routers). Stable: It is more stable than using 3G on my laptop, and in fact has maintained connections for 6 hours straight or longer. and finally... the biggie: Non-PC device support. You can now use the 3G networking with any device you please, whether it runs a supported OS or not, whether it even has a USB port or not. This means you can have always-on internet for your iPod touch, PSP, Mylo, Netbook, etc. You simply switch the pocket WiFi on, and connect to it as you would connect to any other WiFi access point. Even the iPhone benefits from this, since eMobile's unlimited data plan is much cheaper than the typical data plan from Softbank. You can pay one bill and have all of your internet access needs covered anywhere you go in Japan. For the D25HW: The unit can be used in Ethernet-over-USB mode by turning off the WiFi. It seems that in this mode, the batteries won't drain at all, and the unit will actually charge. The newer GP01 units charge via the normal USB cable quite well. For the D25HW, there are special charging cables that can be used to force it to charge from a PC USB connection. Update: D25HW will charge from a normal cable on a any computer if you apply the latest firmware update. Extended batteries are available from Mugen Power for the D25HW, and officially from EMobile for the GP01. Thirdly, if you want to use this device to replace your home internet, then you might or might not be happy. Besides the slower speed when compared to a service like NTT/OCN/Flet's Fiber, there is the five device limit and the fact that when you leave home with the device, anyone left at home won't have internet. Finally, eMobile offers 42Mbps service, but the H25DW device can only do 7.2Mbps, so it isn't the best modem in every way. While the GP01 can theoretically do 21Mbps, the real world speed is of course usually much less. The Pocket WiFi has a MicroSD card slot, and functions as a reader, but only when using the USB cable. (i.e. it doesn't do file sharing over WiFi). Update: If you install Software update #3 on the GP01, it will allow you to access the SD-Card over the LAN. Global roaming is available, but only in a few countries where the 3G networks are up to par (basically Australia and South Korea). This costs, get ready for it, 2 Yen per Kilobyte. That is, 100k=200 Yen. Roughly $USD 5 for an average web page. You don't want to do Windows update (or similar) when on international roaming. When plugged into a PC, the D25HW seems to charge only by when you turn it off. (see above) This means if you use it all day long, the battery will eventually go down to one bar. Update: If it is off and connected by USB, it will charge. If it is on, but not active, it will charge slowly. If it is on and in active use (i.e. transmitting data), it will not charge. When plugged into the wall adapter, it will charge to a certain regardless of usage. These issues do not apply to the newer GP01. Update: These issues were resolved with the latest D25HW software update. The modems can be used in non-WiFi mode (i.e. as a USB modem like previous models), but drivers may have to be installed for that functionality, depending upon your Operating system. The manual doesn't mention anything about it. (Update - See note above about Ethernet-over-USB mode). If you are in an area with no 3G reception (f.e. the Subway), then it will still generate the WiFi signal, and thus if you glance at your laptop or iPhone you will see a deceptive "Full Signal" icon, even though there is no actual internet. Sure, technically, you have a full strength connection to the router, but that's not very useful. It would be nice if there was an optional included utility to show the signal strength on PCs. (Note, you can check on the device's screen itself, or from the admin web page).Update: Check out the Pocket WiFi Monitor Utility by Galapagos software! This utility works on both the GP01 and D25HW, as well as newer models, and allows you to monitor signal strength, battery, data traffic, and more! Other monitors for the D25HW are available for Android. Also, the GP01 allows you to monitor the signal strength from mobile devices via a web page. For those who are familiar, there has been a similar device available in the US for a while, the "MiFi". The main drawback compared with the eMobile Pocket WiFi is that the US carriers have lower connection speeds and usage quotas, making it much less realistic for many uses. I confirmed with eMobile staff that there is no monthly quota on the "unlimited service" "M plan". Sony Mylo 2: Connects no problem in WEP mode, full signal strength. Placed one hour international call with Skype. No voice quality or other issues. Google talk also works fine. iPod Touch 1G: Connects with no issues, everything works normally. (Safari, mail, etc.) Note that iPod seems to disconnect the WiFi when in screen lock mode - which would prevent it from receiving notifications of calls, etc. iPod touch 3G: No issues, everything works fine, in iPhone OS 3.0, 3.1.x, and OS 4 Beta.. Sad that Skype can't run in the background though, see potential fix here. Sony PSP Go: Connects with no issues, Skype and PSP Browser work fine. Mac OS X Snow Leopard: Connects and works fine. Admin page works fine. If connected with USB cable, the internal MicroSD card can be mounted and used. We have gotten the device to stay connected for over 7 hours straight. There are no issues there. There is a setting in the menu for idle time-out, which can be set from 10 minutes to 60 minutes. Setting it to 60 minutes essentially ensures it will never time out (because any device you have running any connected software will access the internet at least once per hour). Besides that, there is a WiFi timeout setting, which can be enabled or disabled, and when enabled set to 5, 10, or 20 minutes. If you are using the PocketWiFi for something like IM or VOIP, you might want to set it to disabled. Otherwise, if you are only doing occasional web browsing, 10 minutes is fine and might save some battery power if you aren't using it. Speed of course varies, but the advertised speed is typically a theoretical maximum. Once you take into account protocol overhead, signal strength, etc., you are lucky to get half of that in real world use. Emobile doesn't lie, and in fact, it's not uncommon to get 7 or 8 Mbps in the city, especially outside. That said, in our testing in various places around Tokyo, more typical speeds when indoors with a signal strength of about half are something like 2.5-3 Mbps down and 1-1.5 Mbps up, with about 50-60 seconds ping time. The worst result was in a crowded coffee shop in the basement in the suburbs. There we got 500Kbps down and about 300 up, with 59ms ping time. For most users, what's more important than raw speed is what applications you can realistically use it for. It's more than fine for web browsing and email, and works very well for file transfers. Skype (including video) works very well, and remote screen sharing isn't too bad either. Youtube HD works fine, I wouldn't count on it to do uncompressed streaming HD video though. Note that for the GP01, eMobile also offers a cheaper plan, which will limit your access to some Peer-to-peer applications. You have to see the contract for details, but for example: Skype is allowed, but internet radio is not. Besides the existing MiFi, which is a sorry competitor, there have also been a few announcements about newer higher spec products recently from CradlePoint. Update: Softbank now also offers the same device! The model number is different (C01HW), but it's obviously the same hardware. Update: Seems a similar device by the same manufacturer is available in Europe: Virgin Wireless WiFi Modem. If you buy one of these, please by nice and share your internet with those less fortunate than yourself. If you think it's a big security risk, think again. If your applications are using unencrypted traffic, then you're not secure even in a wired network. If your traffic is secure, then it doesn't matter if you share your internet. Also, the Pocket WiFi ships with "Privacy mode" enabled by default (This means that even machines on the same network can't see each other's traffic - and will stop you from file sharing between your own machines!). It won't hurt you, and it helps everyone. This applies equally to home internet as well. If you are worried about security, then get a FON access point - you will have the additional advantage of being able to use other Fon access points everywhere you go. A manufacturer going by the name "Mugen Power" (literally: Unlimited Power) is selling extended battery packs for the Original Emobile Pocket WiFi, though presumably they will work for the Softbank version as well. These batteries are much thicker than the original, and thus should last at least 3-4 times as long. Despite the additional thickness, the total size of the device doesn't increase enough to be a problem, and can still be easily stuffed in your laptop bag or purse. (It would bulge a shirt pocket though). Effectively, you should be able to use the device the entire day without ever worrying about charging the battery (except at night as you sleep). This makes it entirely possible to forego the data plan on your cell phone, and use the pocket WiFi instead. Moreover, if you don't leave the device on all the time, it will probably last you a week. Obviously, an alternative to purchasing the extended battery would be to purchase more than one standard battery, and keep them both charged. This seems to be more of an inconvenience than it's worth, though, since you have to swap batteries to charge them, and then again to use them. Note that the D25HW batteries do work in the GP01, although the case is slightly different. The GP01 also has its own official extended battery available, which comes with a suitable case. Photos of the Mugen Power extended battery for the D25HW can be seen in this article. Please note that the battery is sold both with, and without the enlarged back panel to hold it. You can purchase the battery online at Amazon.com, as well as other retailers. Note that if you purchase the battery, you should purchase the version with the back panel included. The battery-only SKU is intended for replacement extended batteries. You can check the manufacturer's official page here. (Or for another option, see here: Ext Power). Although the Pocket WiFi D25HW can be connected to laptops and other USB power sources via a normal USB cable, it will only charge very slowly if off (and not at all if on and actively in use). This is frustrating, because most people don't want to turn it off to charge it, and many computers and battery chargers could handle the power draw. Moreover, carrying around the AC charger seems like a waste. Luckily, it has been discovered that the "Rasta Banana" USB charging cable originally designed for Motorola phones works with the D25HW as well. We have tested this with a Dell PC, an Apple MacBook Air, and several other random Windows PCs, all with success. (This cable can also be ordered on Amazon.com). Update: If you install the latest software update for the D25HW, this cable is no longer necessary. We haven't yet tested the charging cable with battery powered phone chargers, but will soon. If you are using a GP01, then this issue does not apply, as it charges while active if connected to a computer using the included Micro USB cable. 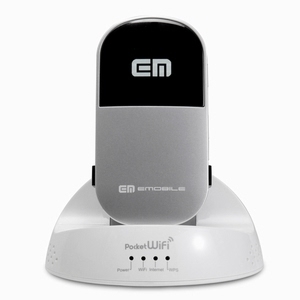 Emobile has announced that a new model of Pocket Wifi, the GP01 which went on sale on 11-March-2011. This model is essentially the same as the previous model, but has a download speed of up to 21Mbps, which should be helpful for downloading large files and streaming video. The upload speed remains the same as the previous model, at 5.8Mbps. Furthermore, they are offering a big discount on the data plan for new users, as well as a 7 hour extended battery pack. If you were on the fence about signing up for Pocket WiFi, the time to act is now, because the above incentives will only last until March 31st. More information can be found at Emobile's GP01 detailed Information Page. Note that existing Pocket WiFi Owners can upgrade for as little as around 3000 yen, depending on their data plan. Another interesting fact is that Emobile is pushing an official extended battery pack for this model, which is a little more reassuring than the unofficial battery pack available previously for the D25HW. It looks like the power and WiFi buttons are combined in this model, the WPS button is separate, and the Connect button is gone. There is still an SD Card slot. Another difference is that the Mini USB connector has been replaced with a Micro-USB connector. Otherwise, the unit looks almost identical to the first generation D25HW. As for the actual speeds, we are preparing a test of speeds for the Original Pocket WiFi, Pocket WiFi S, and the new model. These speeds will be measured at various places around Tokyo, but it will take some time to complete the tests. Emobile has released a press release about a new docking station for the D25HW Pocket WiFi. This docking station not only charges, but acts as a WiFi base station. When the Pocket WiFi is not inserted, it will act as a WiFi router for your normal home internet, if connected by ethernet cable. It includes indicators for Power, WiFi, Internet, and WPS. It is not clear at this time whether it is compatible with the extended battery, but one would have to assume not. If you are using a PC or Mac with your GP01, then you can use the excellent Pocket WiFi Monitor Utility by Galapagos software to keep an eye on the battery level, data traffic, signal level, and more from your PC. The software runs in the background and displays a signal indicator in the system tray. You can bring up more details, including graphs, etc., by clicking this icon. Update 5: On 2011.07.20, eMobile has released an update for the GP01 firmware to address issues with international roaming. Information about this update can be found on this page at eMobile's site (Japanese). Update 6: eMobile released a new model on 2011.07.28 supporting 42Mbps maximum download speed via DC-HSDPA, called the GP02. This model is somewhat different, so it is covered under a separate review. Update 7: There are two updates for the GP01, Update #2 and Update #3. If you install Update #3, it will add NAS functionality for the SD Card so that you can access it over the network, and also Multi-NAS functionality so that you can create multiple wireless networks from a single router.